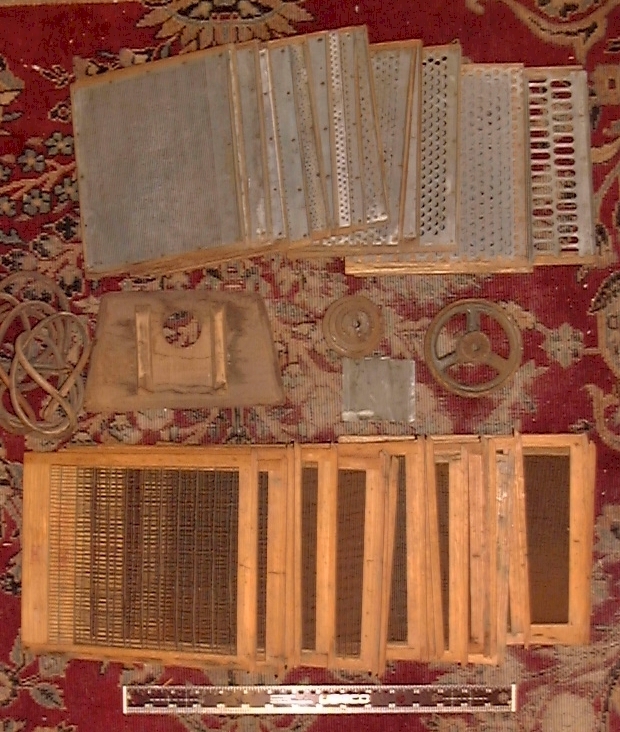 "A box containing a total of 38 wood and wire mesh seed sorting screens dating from the late 19th century - early 20th century from the Frederick W. Eberle Seed Company Albany, New York. Lot consists of (18) screens measuring 10 1/4" by 8 1/4" and (20) screens measuring 8 1/4" by 7 1/4" each having a different size mesh. The box also contains a couple pulleys which apparently went with the original seed sorting machine which these screens must have been used in." The frames appear to be oak and the screens either punched galvanized or steel mesh. The corrugated cardboard box with the seed company logo on the side may or may not have anything to do with the make and model of the manufacturer of the seed cleaner in which these screens are intended to be used. If anyone has any clues or information regarding the history and origin of these screens, we would greatly appreciate hearing from you. Click here to contact us. 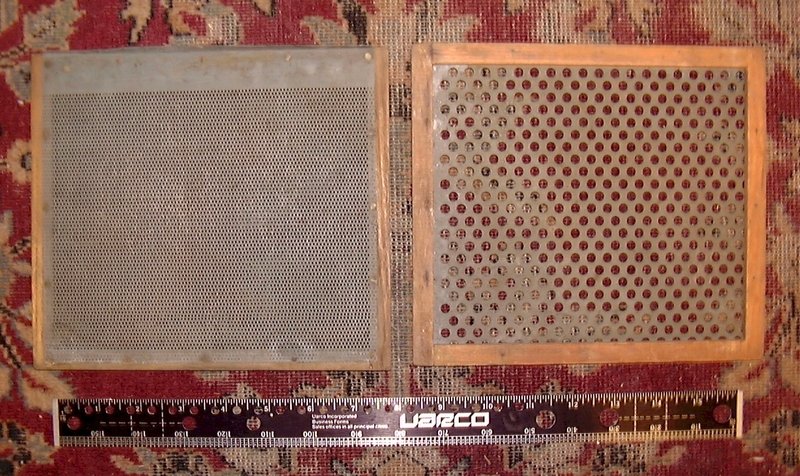 Here are front and back examples of two of the larger (10-1/4" by 8-1/4") screens. All of the clues. 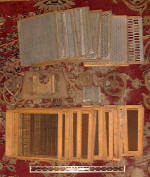 Here is the pile of screens as well as the extra parts that accompanied them. 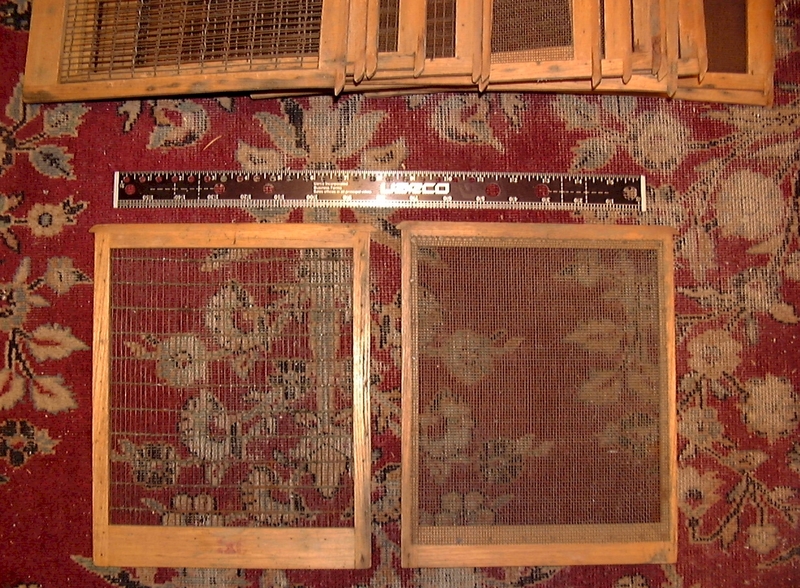 Here are front and back examples of two of the smaller (8-1/4" by 7-1/4") screens.